Lyndell Johnson moved from linebacker to safety last season and started three games for Oklahoma State. 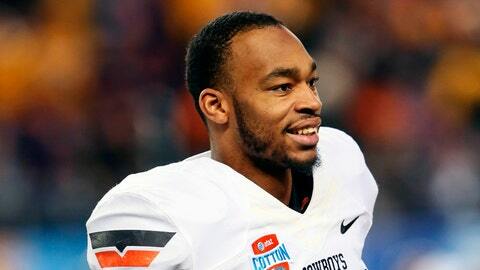 Oklahoma State safety Lyndell Johnson has left the team, coach Mike Gundy confirmed at a news conference on Monday. Center Jake Jenkins has also left the team and won’t continue his career after graduating. Gundy cited "personal reasons" for Johnson’s exit. Johnson moved from linebacker to safety last season and started three games. He finished the year with 54 tackles, fifth-most on the team. Oklahoma State begins spring practice today. Johnson was expected to move into a starting role. Instead, Deric Robertson and Jordan Sterns will compete with senior Larry Stephens this spring to replace departing starters Zack Craig and Daytawion Lowe. Jenkins started 12 games last season.